This is first in a series of entries in which I will try to understand the effects of war on those who experience it up close. 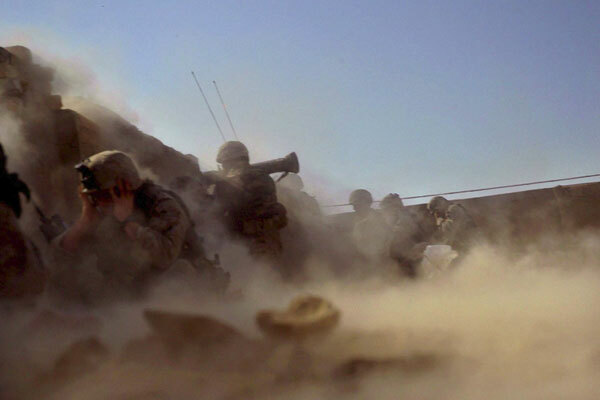 Photographer Ashley Gilbertson closely followed US Marines in Iraq. Undoubtedly, those involved in a war inherit scars, visible and not, tangible and not, that take a long time to heal. If they heal at all. The lucky few who manage to come out in one piece will be haunted by the loss of loved ones, by images of gruesome violence, and by the screams of children they could not rescue. The soldier, especially, bears the most extreme emotional toll of the war. He is the one carrying the gun. Whether he shoots or not, whether he saves or not, whether he acts or not will always live with him. But what about the reporter on the ground? How does he fare after a war is over? How taxing is the experience for him? In recent years, war-correspondence has certainly become much more intimate. The war in Iraq, especially, has seen tremendous human resource deployed for its reportage. Journalists have taken enormous risks to feed the public with details of the battlefield. After a brief while of initial freedom for reporters, Iraq became too dangerous. Reporters could not move around on their own. They had to embed with a military team. So, to record the happenings on the ground, the reporter shadowed the soldier, following him into battle, dodging the same bullet, walking the same number of hours without rest, and eating the same M.R.E. In a sense, the reporter is becoming more and more involved in the experience of war. He faces similar realities as the soldier. Yes, he does not bear the same “moral compulsion” because he doesn’t make decisions of life-or-death as the soldier does. But, as American journalist Dexter Filkins and Australian photographer Ashley Gilbertson would tell you, the experience of war haunts the reporter as much, depriving him of a sense of normalcy long after the war is over. Usually, the reporter also feels up-close what the soldier only sees in passing: the pain of the civilians caught in the middle of the chaos. He gazes at their wounds, records their screams, and notes their hopelessness. True, the soldier too sometimes, mingles with the civilians. But his contact is not as intimate as the reporter’s. One can only get a better sense of what the war experience is to a reporter by reading their own words. Bellow, I share excerpts from the works of New York Times foreign correspondent Dexter Filkins and photographer Ashley Gilbertson. “War, the old saying goes, is seven parts boredom and one part terror. A soldier mans a post for hours on end, with only the crickets to liven his night. Life in the village carries on, the distant armies no more troubling than the clouds on the horizon. Then, in a flash, all is changed: lives are upended, bodies wrecked, futures destroyed. This is war’s way. In the early years of the war, Filkins and Gilbertson embedded together with Bravo Company in Falluja. Their reporting from the front-line, both the pictures and writing, is riveting. 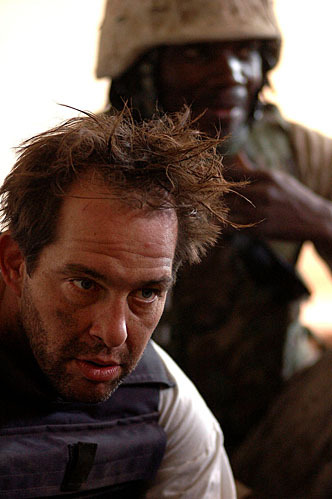 Dexter Filkins, photographed by Ashley Gilbertson during the embed with the marines. One incident on the mission, however, highlights the intimate relationship of the reporters with the soldiers and the trauma that they both share in. Apparently, Bravo company came under fire from a tower. After an exchange that lasted a couple hours, the fire ceased. The marines felt that the insurgents had been taken out. The editors in New York had asked for a photo of the dead insurgents and Gilbertson felt the moment right. He notified the commander that he wanted to go up to the tower and photograph dead insurgents. The commander, Gilbertson says, insisted that they be accompanied by a group of his marines. So Gilbertson and Filkins followed a group into the tower. However, as soon as they started climbing the stairs, shooting began again. Lance Corporal Miller, who was one of the marines accompanying Gilbertson and Filkins, had been the first to go up. He was shot. The rest ran back, but there was no sign of Miller. Ashley was sitting on the stoop beside the entrance to the minaret mumbling to himself. His back was turned to the tower, and his helmet was on crooked so he looked especially vulnerable. His shoulders were heaving. My fault, he was saying, my fault. There was blood and bits of white flesh on his face and on his flak jacket and on his camera lens. My fault. The firing stopped. Smoking rifles. Two more marines went up, and the minaret began to come apart. Bricks falling, dust and rocks, the tower swaying… Ashley was still seated on the stoop, helmet crooked, mumbling to himself like a child. My fault. Miller appeared. Two marines had pulled him out…Miller was on his back; he had come out head first. His face was opened in a large V, split like meat, fish maybe, with the two sides jiggling. “He is dead,” I said. I felt it then. Darting, out of reach. You go into these places and they are overrated, they are not nearly as dangerous as they say. Keep your head, keep the gunfire in front of you. You get close and come out unscathed every time, your face as youthful and as untroubled as before. The life of the reporter: always someone else’s pain. A woman in an Iraqi hospital cradles her son newly blinded, and a single tear rolls down her cheek. The cheek is so dry and her tears move so slowly that you focus on it for a while, the tear traveling across the wide desert plain. Your photographer needed a corpse for the newspaper, so you and a bunch of the marines went out to get one. Then suddenly it’s there, the warm liquid on your face, the death you have always avoided, smiling back at you like it knew all along. Your fault. * Source of the opening quote is the book A Time of Our Choosing: America’s War in Iraq. This entry was posted on Monday, September 6th, 2010 at 4:43 am	and tagged with America, Ashley Gilbertson, Australia, book, Bravo Company, CBS, Conflict, Corporal, Death, Dexter Filkins, experience of a reporter, Frontlines, Guilt, Iraq, Journalism, Marines, New York Times, News, newspaper, Photographs, Photography, reporters, reporting, soldiers, Terrorism, The Forever War, Trauma, United States, War and posted in News and Politics. You can follow any responses to this entry through the RSS 2.0 feed.